This article written by Nemenzo, Gemma from Filipinas (August 2008) is very timely and INTERESTING. The title of the article is “A Different Take: An Interview with Rep. Roquito Ablan.” A lot of you may not know him, but during the Marcos Era, he was a “force” back then. Filipinos are made to believe that Ferdinand E. Marcos and Ninoy Aquino were really arch nemesis, rivals, and even foes. But from this interview, we can see the A DIFFERENT VIEW on what was really happening during those times. While writing a book about Upsilon Sigma Phi, the fraternity both Ferdinand Marcos and Ninoy Aquino belonged to, Filipinas managing editor, Gemma Nemenzo, did a one-on-one interview with Congressman Roquito Ablan of Ilocos Norte. Ablan had the unique privilege of being close to both Ninoy, his batchmate in Upsilon (batch 1950), and Marcos, the undisputed lord of Ablan’s province. With such proximity to the two political superstars of that era, the congressman had a ringside view of what was happening behind the scenes of the Marcos-Aquino saga. People close to Marcos confirm that Roquito Ablan then had a direct line to the former president. Upsilonians also know that he and Ninoy Aquino remained close friends. I first met Ninoy at the University of the Philippines (UP) when we were neophytes in 1950. He was a professional absentee from classes. I was working with LUSTEVECO then so I had an open expense account so I would gas up Ninoy’s car. The two of us were the most hazed neophytes in our batch. Our initiation lasted one year and one semester. We joined Upsilon because it was “the only frat in UP”; to be an Upsilonian, you must be good. Ninoy and FM (Ferdinand Marcos) were more than friends. When Ninoy was in detention, he and FM would speak with scrambler telephones. During FM’s state visit to the U.S. in 1982, the two of them talked for an hour about good times. FM was actually considering Ninoy as his successor. He admired Ninoy for his being a courageous fighter and his vigor. They were on the same wavelength. In fact, Ninoy’s “Iron Butterfly” speech against Imelda and the Folk Arts Theater was edited by FM. I know because I was the intermediary. From the very beginning, FM gave instructions to the military to be lenient with Ninoy. I met up with Ninoy in New York on April 22, 1983, which was my birthday. He told me he needed a passport. secretary of Foreign Affairs Collantes had earlier issued a memo stating no renewal for Ninoy’s passport. So I checked with FM on the phone and Joey Ampeso, a consular officer assigned in New Orleans and an Upsilonian, was asked to assist Ninoy, which he did. 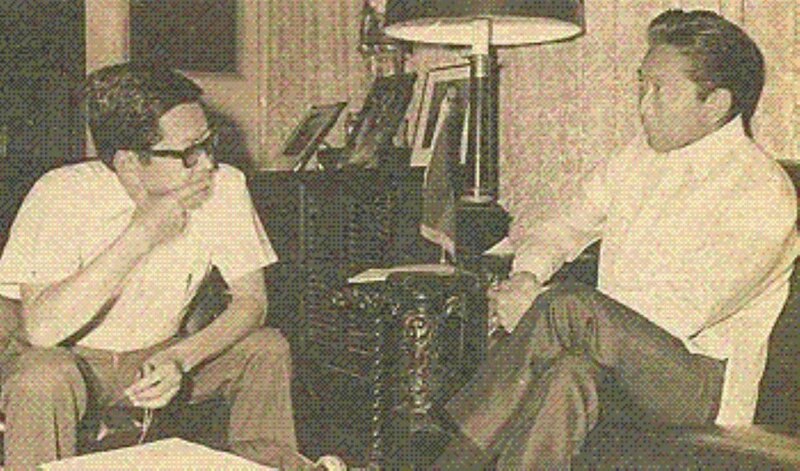 In early August, FM and Ninoy talked about the latter returning to the Philippines and FM told him not to come home yet because he (FM) was weak and he couldn’t protect Ninoy. On August 17, there was an earthquake in Laoag, Ilocos Norte, so I had to be there as acting governor. I sent two planes to meet Ninoy in Taipei but the first plane, which carried a top officer, could not locate him because he was using a passport with a different name. FM’s instructions were to bring Ninoy to Basa Air Base, load him in the presidential helicopter and bring him here to Manila, to protect him. On August 20, I left Laoag at 10 in the evening so I could be in Manila in time to meet Ninoy at the airport. I didn’t think much of it then, but my plane was grounded (by someone who knew the chain of command) and the second plane was prevented from taking off When I was driving to the international airport, my car was delayed because of a rally of another Upsilonian, Doy Laurel, in front of Baclaran Church. I arrived at the airport 12 minutes after Ninoy was shot. Someone met me and said “wala na si Ninoy (Ninoy is gone).” I cried like a baby when I found out what happened. If I arrived on time I could have escorted Ninoy from the aircraft and he would not have been shot, or I would have been shot along with him on the stairs. Courtesy of Nemenzo, Gemma from Filipinas. This entry was posted in Uncategorized and tagged August 21, Basa Air Base, Benigno Aquino, Ferdinand Marcos, Gemma from Filipinas, Gemma Nemenzo, Iron Butterfly, Joey Ampeso, Jr., LUSTEVECO, Nemenzo, Ninoy Aquino, Ninoy assasination, Roquito Ablan, University of the Philippines, Upsilon Sigma Phi. Bookmark the permalink. Well, Marcos would have been smart enough to keep all doors open. i think ninoy’s speech against imelda was not edited by a friend. it was censorship by a dictator. Hi Joseph, I have some relevant materials that I think you might find interesting. Please contact me at my email. Thanks.